Post boxes or letter boxes come in different types and qualities and when decorating your home interior, these would tend to be among the most important items you would want to obtain. A good interior designer and the homeowner will have a great eye for detail. 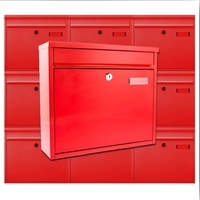 A number of considerations will have to be made when picking a post box and this would be determined by the size of the area you need it to go to, your location together with what you would prefer. 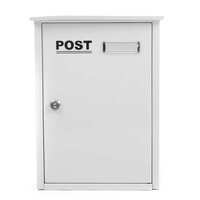 Below are popular categories of post boxes or letter boxes for different purposes that you could order right away. 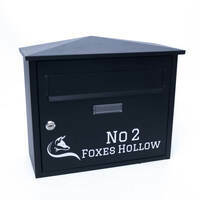 The Black tweed letterbox is very chic, very stylish andcontemporary in design.With security in mind, the front posting slot is hidden underneaththe lid and the lock is hidden from view.The front of the box is built using a thicker grade of steel than usualmaking it that little bit more sturdy.The letterbox easily houses A4 size letters, keeping them out of theweather.- Size: H x W x D: 450mm x 320mm x 105mm- Post Slot Size: 300mm x 40mm- Weight: 3kg- Available in black- Unsuitable for coastal areas as salty air will cause tarnishing.- Delivered in 5-7 days. 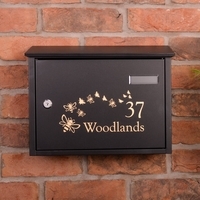 Using our personalisation tool, you can add your address along witha motif to our Dublin black letterboxes. Choose from a selection offont styles and a huge range of motifs. 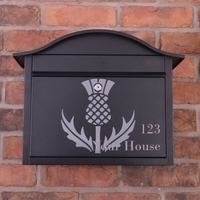 You can then choose white,silver or gold colour for the text and motif.All of our personalised letterboxes are hand painted by our skilledcraftspeople in our North Wales workshop.- Overall size- 34cm x 43.5cm x 19cm.- Sturdy galvanised steel construction with lockable, drop down door.- 2 keys and wall fixing included.- Post slot size 32cm x 3.4cm.- Delivery in 5-7 daysSpare keys are available to be purchased if you ever lose them or require more keys.There is a handy video guide to using our personalisation tool below if you require any guidance or advice. VIDEO GUIDES How to use the personalisation tool. 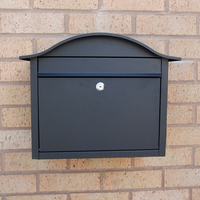 The Saturn Black Letterbox is a contemporary design letterbox witha good amount of space for your daily post and a parcel or two.It is made from galvanised steel with a black finish. 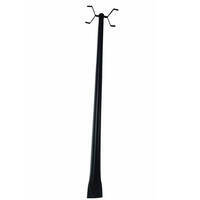 The Saturn Blackhas A4 capacity meaning you can be sure your post wont stick out ofthe top. 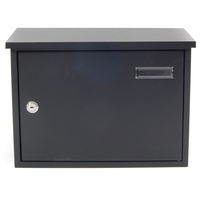 - Saturn Black Letterbox- Overall Size: 32 x 20 x 8.5cm.- Sturdy galvanised steel construction with black finish.- Lockable front opening door with a lift post slot cover.- 2 keys and wall fixings included.- Post slot size 18 x 2.5cm.- Delivered in 5-7 days- Not recommended for coastal areas, salty air will cause tarnishing. Personalised version available HERE VIDEO GUIDE Here is a video guide showing how to fit your letterbox. 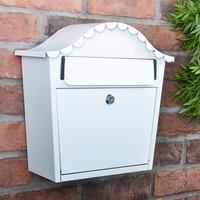 The All weather White plastic letterbox is modern and stylish and is ideal forthose living along the coastand of course elsewhere.This letterbox is a white gloss, plastic construction and is lockable by key.It comes with wall fixings and we have included a how to video as a guideto fixing your letterbox to an exterior wall.Size: 35 x 25 x 10cm.Delivered in 5-7 days.- All Weather White Plastic Letterbox- Overall Size: 35 x 25 x 10cm.- White gloss plastic construction.- Lockable letter box with drop down door.- 2 keys and wall fixings included.- Post slot size 21.5 x 2.5cm.- Allow 2-3 days to be delivered. 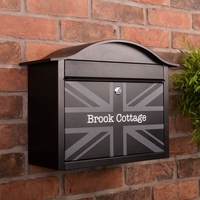 The Campagne Black Letterbox is a stylish and modern designed letterboxwith plenty of spcae for your daily post, and parcels. It has depth which allowsbigger A4 letters to be deposited without sticking out. 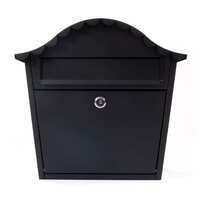 - Campagne Black Letterbox - Overall Size: 38.5 x 26 x 11cm. 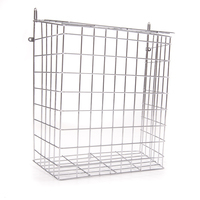 - Sturdy galvanised steel construction with black finish. - A4 capacity. 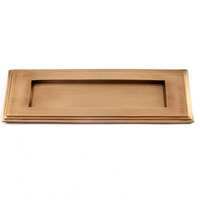 - Lockable front opening door with a lift post slot cover. 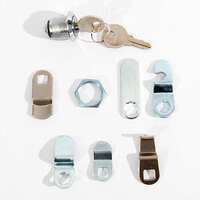 - 2 keys and wall fixings included. - Post slot size 23 x 3.5cm. - Delivery 2-3 days Personalised version available HERE VIDEO GUIDE Here is a video guide showing how to fit your letterbox. 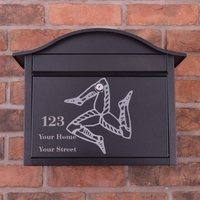 The Mississippi US mailbox in black aluminium is manufactured in the USAby the market leader Solus Group Inc. Made from lightweight, durable and powder coated aluminium which isweather proof, ideal for coastal areas and areas where the environmentis harsh. The Mississippi US mailbox is embossed with US Mail and US Postmaster General Approved it opens from the frontand comes with the iconic red flag we see so often in theHollywood movies. 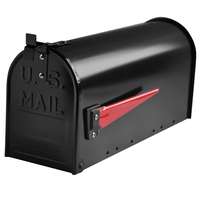 - Mississippi US mailbox in black aluminium, - Manufactured in the USA by the market leader Solus Group Inc. - Officially embossed with U.S. Mail and U.S. Postmaster General Approved - Can be purchased with a stand (sold seperately) - Available in Steel or Aluminium. The compact black is slim, and discreet but large enough tofit all of your daily post. Ideal for town houses.- Overall size: 28.5 x 24 x 9.5cm. 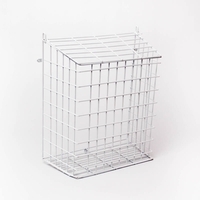 - Sturdy galvanised steel construction with black finish. - Lockable, side opening door. - 2 keys and wall fixings included. - Post slot size 20 x 3.5cm. 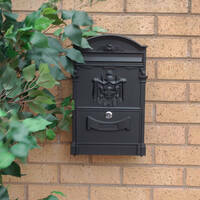 - Delivery in 2-3 days VIDEO GUIDE Here is a video guide showing how to fit your letterbox. 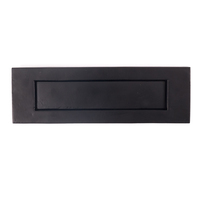 Our solid, black iron letter plate is a beautiful addition to your home.A traditional looking letter plate, with a hammered, uneven surfacefinish. This product matches our other black iron products perfectly. Dimensions: 8cm Height x 26cm Width Delivered in 5-7 days. 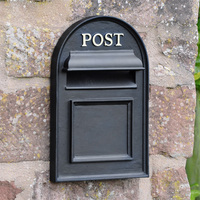 The Campagne Black Letterbox is a stylish and modern designed letterboxwith plenty of spcae for your daily post, and parcels. It has depth which allowsbigger A4 letters to be deposited without sticking out. 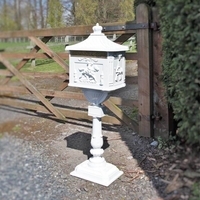 - Campagne White Letterbox - Overall Size: 38.5 x 26 x 11cm. 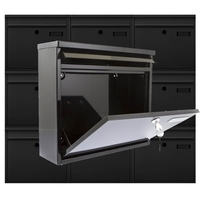 - Sturdy galvanised steel construction with black finish. - A4 capacity. 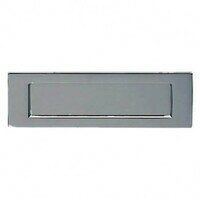 - Lockable front opening door with a lift post slot cover. - 2 keys and wall fixings included. - Post slot size 23 x 3.5cm. - Delivery 2-3 days. Personalised version available HERE VIDEO GUIDE Here is a video guide showing how to fit your letterbox. 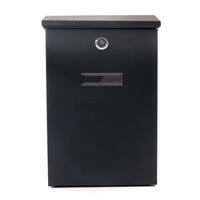 An elegant, and traditional style letterbox perfect for any home.This imperial black letterbox is made from aluminium and steel with a blackfinish.It has a lockable, drop down door and comes with 2 keys andwall fixings, everything you need to fit your letterbox.We dont recommend these letterboxes in coastal areas assalty air can cause tarnishing.This particular product cannot be personalised.Dimensions: 42 x 25 x 7.5cmDelivery 2-3 daysSturdy aluminium construction with black finish. Lockable, drop down door. 2 keys and wall fixings included. Post slot size 22 x 4cm. Delivery 2-3 days. This letterbox cannot be personalised. 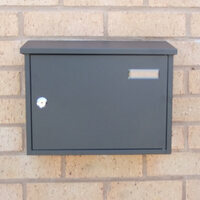 Dimensions: 42 x 25 x 7.5cm VIDEO GUIDE Here is a video guide showing how to fit your letterbox. 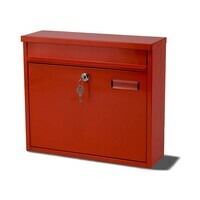 An elegant, and traditional style letterbox perfect for any home.This imperial red letterbox is made from aluminium and steel with a blackfinish.It has a lockable, drop down door and comes with 2 keys andwall fixings, everything you need to fit your letterbox.We dont recommend these letterboxes in coastal areas assalty air can cause tarnishing.This particular product cannot be personalised.Dimensions: 42 x 25 x 7.5cmDelivery 2-3 daysSturdy aluminium construction with red finish. Lockable, drop down door. 2 keys and wall fixings included. Post slot size 22 x 4cm. Delivery 2-3 days. This letterbox cannot be personalised. 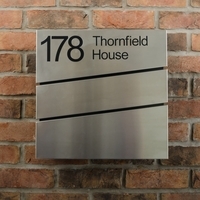 Dimensions: 42 x 25 x 7.5cm VIDEO GUIDE Here is a video guide showing how to fit your house sign. A contemporary design with a black finish and silver front opening door.A stylish addition to any home.Tarnishing may occur from salty air, therefore we do not recommendthese letterboxes for use in coastal areas. - Overall Size: 28 x 26 x 16cm. 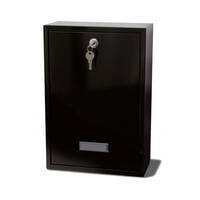 - Sturdy galvanised steel construction with black finish.- Lockable front opening door with a lift post slot cover.- 2 keys and wall fixings included.- Post slot size 24.5 x 3.5cm.- Delivery 2-3 days. Personalised version available HERE VIDEO GUIDE Here is a video guide showing how to fit your letterbox. 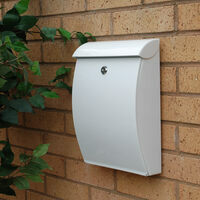 The All weather White plastic letterbox is ideal for those living along the coastand of course elsewhere. The design is modern and stylish, and this letterboxcan be personalised with your address.Select your font style and a motif using our personalisation tool. You can thendecide which colour you would like your text and motif to be painted. If youdecide that you do not want a motif, our skilled craftsmen/women will centraliseyourwording.- All Weather White Plastic Letterbox- Personalised with your address - Overall Size: 35 x 25 x 10cm. - White gloss plastic construction. 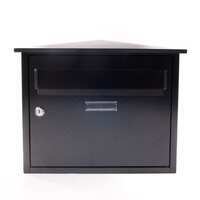 - Lockable letter box with drop down door. - 2 keys and wall fixings included. - Post slot size 21.5 x 2.5cm. 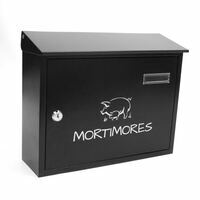 - Personalised letter boxes may take 5-7 days to be delivered. VIDEO GUIDES How to use the personalisation tool. 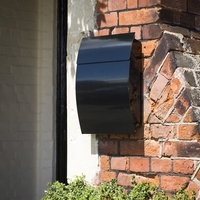 The Belfast black letterbox is modern and stylish and perfectfor those of you with dogs who have a habit of chewing yourpost.Simply attach to an exterior wall with the fittings providedfor a sturdy, steel construction that will last for years to come. 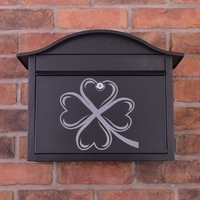 Belfast Black Letterbox - non personalised version Overall Size: 33 x 38 x 17cm. 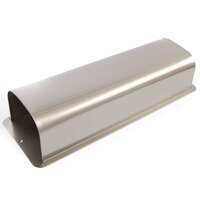 Sturdy galvanised steel construction with black finish. Lockable, side opening door. 2 keys and wall fixings included. Post slot size 29.5 x 3cm. Delivery 2-3 days. Personalised version available HERE VIDEO GUIDE Here is a video guide showing how to fit your letterbox. 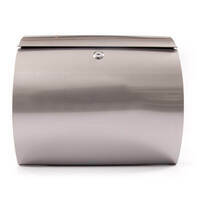 The Stainless Steel tweed letterbox is very chic, very stylish andcontemporary in design.With security in mind, the front posting slot is hidden underneaththe lid and the lock is hidden from view.The front of the box is built using a thicker grade of steel than usualmaking it that little bit more sturdy.The letterbox easily houses A4 size letters, keeping them out of theweather.- Size: H x W x D: 450mm x 320mm x 105mm- Post Slot Size: 300mm x 40mm- Weight: 3kg- Available in black- Unsuitable for coastal areas as salty air will cause tarnishing.- Delivered in 5-7 days. The Mississippi US mailbox in white aluminium is manufactured in the USAby the market leader Solus Group Inc.Made from lightweight, durable and powder coated aluminium which isweather proof, ideal for coastal areas and areas where the environmentis harsh.The Mississippi US mailbox is embossed with US Mail and US Postmaster General Approved it opens from the frontand comes with the iconic red flag we see so often in theHollywood movies.- Mississippi US mailbox in white aluminium, - Manufactured in the USA by the market leader Solus Group Inc.- Officially embossed with U.S. Mail and U.S. Postmaster General Approved- Can be purchased with a stand (sold seperately)- Available in Steel or Aluminium. 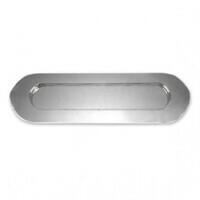 - Dimensions: H x W x D: 222mm x 171mm x 483mm - Weight: Steel: 0.8kg; Aluminium: 0.7kg- Delivered in 5-7 days. 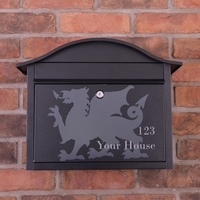 Create a letterbox that is unique to you with our personalisation tool.Type your wording into the box, choose your motif from our hugerange, then decide which colour you would like.The Stainless Steel curved letterbox is modern, and very stylish.Fix it to a wall or gate, to collect all of your daily post. We providethe fixings, and see below ourhow tovideo if you need someextra assistance with fitting.- Overall Size: 33 x 37.5 x 10.5. 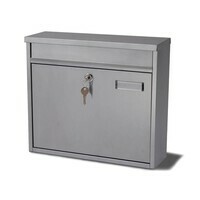 - Sturdy Stainless steel design with brushed finish.- Lockable front opening door with a lift post slot cover.- 2 keys and wall fixings included.- Post slot size 23 x 3.5cm.- Personalised letter boxes may take 5-7 days for delivery.We dont recommend using these letterboxes in coastal areas.Salt air will cause tarnishing. 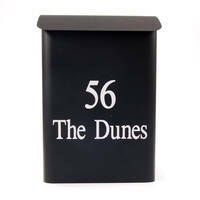 Stylish, and modern, our Dublin black letterboxes areperfect for any home. 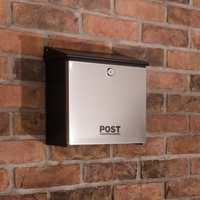 Wall mounted letterboxes areparticularly useful for owners of pets that like to chewpost.They are also useful for those who go away a lot, nopost will be left on your door mat, therefore deterringburglars. 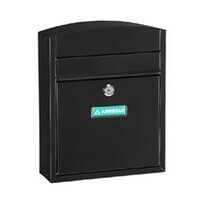 Letterboxes - Dublin Black Letterbox - without personalisationOverall size: 34x43.5 by 19cm cm.Sturdy galvanised steel construction with lockable front opening door. 2 keys and wall fixing included.Post slot size 32 x 3.4cm. Black colour only. Delivery in 2-3 days. 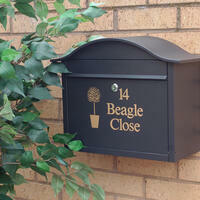 These letter boxes are particularly useful for homes with pets that chew or destroy the post. By keeping your letters safe an secure and out of reach of you pet. 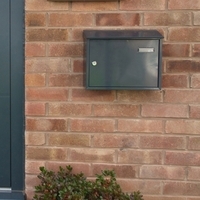 Letter boxes can be fitted to gates, posts and walls. Spare keys for letterboxes may be purchased if lost. 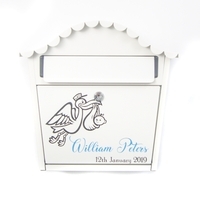 Lots of people decide to have cardboard post boxes at their wedding.We say, why not have a wedding post box that you can then use at home?Get the best of both worlds, and have a beautiful letterbox for years to comefor all to see.You can choose between silver and gold lettering to go onyour letterbox,(the butterfly design will also be painted in your choice of colour)and add your surname and the year you tied the knot.These beautiful letterboxes will be a wonderful addition to your special day.Overall size: 33 x 34 x 13cm.Sturdy galvanised steel construction with white gloss finish.Lockable letterboxwith drop down door. 2 keys and wall fixings included. Post slot size 25cm x 3.5cm. Personalised New Baby Letterbox With Blue Letters.Overall size: 33 x 34 x 13cm. Sturdy galvanised steel construction with white gloss finish.Lockable letterbox with drop down door. 2 keys and wall fixings included. Post slot size 25cm x 3.5cm. With blue and black coloured personalisation. Simply write the names and date in the fields above. 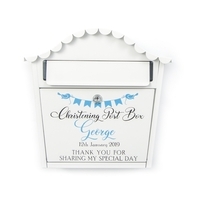 Personalised Christening Letterbox With Blue Letters.Overall size: 33 x 34 x 13cm. 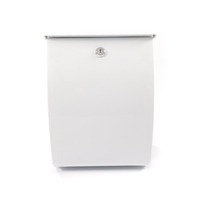 Sturdy galvanised steel construction with white gloss finish.Lockable letterbox with drop down door. 2 keys and wall fixings included. Post slot size 25cm x 3.5cm. With blue and black coloured personalisation. Simply write the names and date in the fields above. Personalised New Baby Letterbox With Pink Letters.Overall size: 33 x 34 x 13cm. Sturdy galvanised steel construction with white gloss finish.Lockable letterbox with drop down door. 2 keys and wall fixings included. Post slot size 25cm x 3.5cm. With blue and black coloured personalisation. Simply write the names and date in the fields above. The Edinburgh blue letterbox is unique in that it has a roundedtop and is different to your usual black letterbox.It is stylish, and modern and would look good on any home.We do not recommend for use in coastal areas asthe salty air can cause tarnishing. - Overall Size: 34 x 38 x 18cm. - Sturdy galvanised steel construction with blue finish. 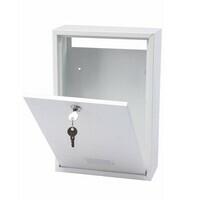 - Lockable, side opening door.- 2 keys and wall fixings included.- Post slot size 24 x 4cm. - Delivery 2-3 days. 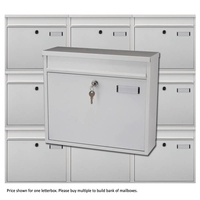 - Spare keys for letterboxes may be purchased if lost. 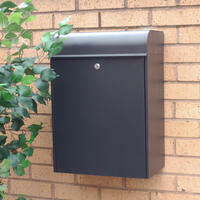 - Letter boxes can be fitted to gates, posts and walls. Personalised version available HERE VIDEO GUIDE Here is a video guide showing how to fit your letterbox. 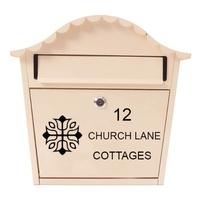 A very pretty and very sweet style of letterbox, best suited to a small countrycottage perhaps?Use our personalisation tool to add your home address to your letterbox.Choose from a selection of font styles and colours for your text. 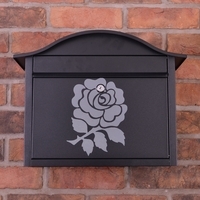 You canalso add a motif from our large range which will also be hand paintedonto the letterbox in your chosen colour.The London white letterbox, is made from galvanised steel with aglossfinish. 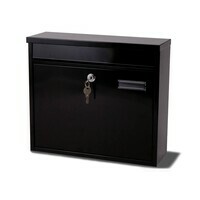 It has a lockable drop down door which comes with 2keys. 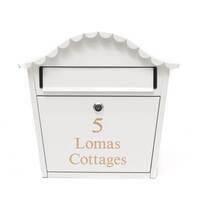 Fittings are included too.Please allow 2-3 days for delivery.We dont recommend these products for coastal areas, as the salty air cancause tarnishing.London White Letterbox - personalised with your address Overall size: 33 x 34 x 13cm. Sturdy galvanised steel construction with cream coloured gloss finish. 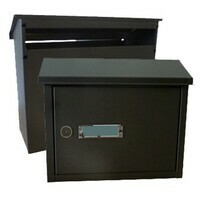 Lockable letterbox with drop down door. 2 keys and wall fixings included. 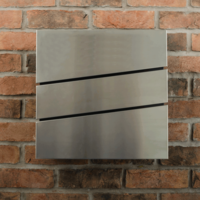 This contemporary, Taylor letterbox is chic and stylish in glossy anthracite grey.Its Made from sturdy steel and with a semi-gloss powder coated finish.All of our letterboxes come with wall fixings and a secure locking door with 2 keys. 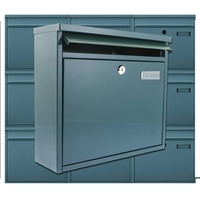 The Taylor letterbox has A4 capacity and plenty of room for all your daily post.We do not recommend these letterboxes for use in coastal areas as the saltyair will tarnish them faster than normal. - Lockable front opening door with a lift post slot cover- Size: H: 28 x W: 35 x D: 11.5cm- Post slot size: 32 x 3cm- Colour: Anthracite Grey RAL7016- Construction: Galvanised steel with powder coated gloss painted finish- Taylor Anthracite Grey Letterbox- Please allow 5-7 days for deliveryVIDEO GUIDES How to use the personalisation tool. 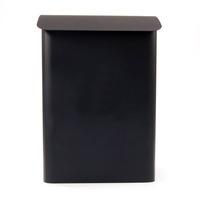 The Campagne Black Letterbox is a stylish and modern designed letterboxwith plenty of space for your daily post, and parcels. 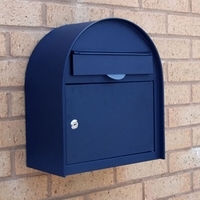 It has depth which allowsbigger A4 letters to be deposited without sticking out.Personalise the Campagne letterbox with your address. Choose a font stylechoose a motif from our huge range and then choose a colour for the detailsto be painted in. 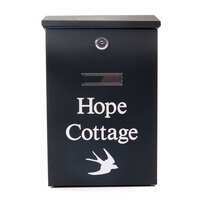 - Campagne Black Letterbox personalised with your address - Overall Size: 38.5 x 26 x 11cm. 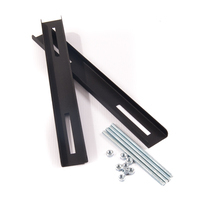 - Sturdy galvanised steel construction with black finish. 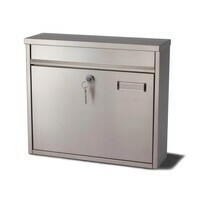 - A4 capacity.- Lockable front opening door with a lift post slot cover.- 2 keys and wall fixings included. - Post slot size 23 x 3.5cm. - If you do not want a motif your wording will be centralised. 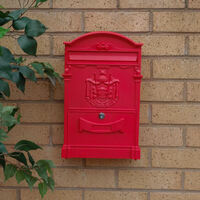 - Personalised letter boxes may take 5-7 days for delivery. VIDEO GUIDES How to use the personalisation tool. 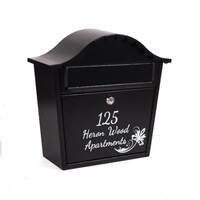 Lots of people decide to have cardboard post boxes at their wedding.We say, why not have a wedding post box that you can then use at home?Get the best of both worlds, and have a beautiful letterbox for years to comefor all to see.You can choose between purple and black lettering to go onyour letterbox,(the bunting and figures design will also be painted in your choice of colour)add the names of the happy couple and the year they tied the knot.These beautiful letterboxes will be a wonderful addition to your special day.Overall size: 33 x 34 x 13cm.Sturdy galvanised steel construction with white gloss finish.Lockable letterboxwith drop down door. 2 keys and wall fixings included. Post slot size 25cm x 3.5cm. 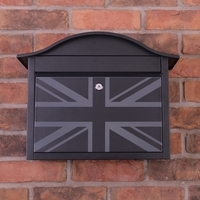 A modern, chic and sweet style of letterbox, best suited to a small countrycottage perhaps?The London black letterbox, is made from galvanised steel with ablackfinish. It has a lockable drop down door which comes with 2keys. 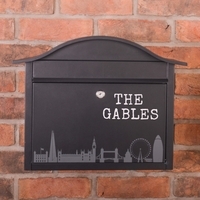 Fittings are included too.London Black Letterbox - non personalised version Overall Size: 33 x 34 x 13cm. Sturdy galvanised steel construction with black finish. Lockable, drop down door. 2 keys and wall fixings included. Post slot size 25 x 3.5cm. Delivery 2-3 days We do not recommend for use in coastal areas as the sea air will tarnish them faster than normal. Personalised version available HERE VIDEO GUIDE Here is a video guide showing how to fit your letterbox. Personalised Autumn Wedding Letterbox With Name Date and Leaves.Overall size: 33 x 34 x 13cm. 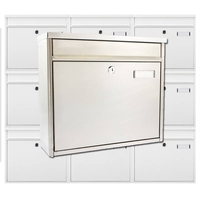 Sturdy galvanised steel construction with white gloss finish.Lockable letterbox with drop down door. 2 keys and wall fixings included. Post slot size 25cm x 3.5cm. With GOLD coloured personalisation. Simply write the names and date in the fields above. Personalised Winter Wedding Letterbox With Name Date and Snowflakes.Overall size: 33 x 34 x 13cm. Sturdy galvanised steel construction with white gloss finish.Lockable letterbox with drop down door. 2 keys and wall fixings included. Post slot size 25cm x 3.5cm. With Silver coloured personalisation. Simply write the names and date in the fields above. 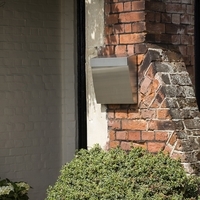 This contemporary, Taylor letterbox is chic and stylish in glossy anthracite grey.Its Made from sturdy steel and with a semi-gloss powder coated finish.All of our letterboxes come with wall fixings and a secure locking door with 2 keys.The Taylor letterbox has A4 capacity and plenty of room for all your daily post.We do not recommend these letterboxes for use in coastal areas as the saltyair will tarnish them faster than normal.Using our personalisation tool you can add your address in a font style from ourselection, and if you so desire, add a motif. You can then choose from silver, whiteor gold colour for your text and motif. 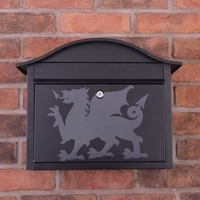 Your letterbox will be hand painted by ourskilled craftspeople.Please allow 5-7 days for delivery.Taylor Anthracite Grey Letterbox personalised with your address Overall Size:H: 28 x W: 35 x D: 11.5cm Post slot size32 x 3cm. 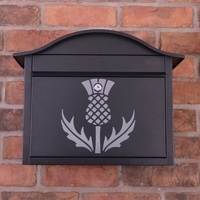 The Edinburgh black letterbox is unique in that it has a roundedtop.It is stylish, and modern and would look good on any home.Please allow 2-3 days for delivery.Overall Size: 34 x 38 x 18cm.Stylish, large capacity letter box.Sturdy galvanised steel construction with black finish.Lockable, side opening door.2 keys and wall fixings included.Post slot size 24 x 4cm.Spare keys for letterboxes may be purchased if lost.Letter boxes can be fitted to gates, posts and walls. We do not recommend for use in coastal areas as the sea airwill tarnish them faster than normal. Personalised version available HERE VIDEO GUIDE Here is a video guide showing how to fit your letterbox. Personalised Christening Letterbox With Pink Letters.Overall size: 33 x 34 x 13cm. 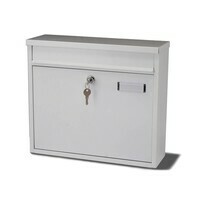 Sturdy galvanised steel construction with white gloss finish.Lockable letterbox with drop down door. 2 keys and wall fixings included. Post slot size 25cm x 3.5cm. With blue and black coloured personalisation. Simply write the names and date in the fields above. 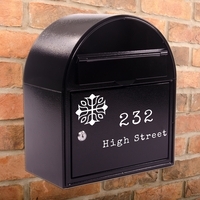 Decorative freestanding, aluminium letter box in black with ornate design. 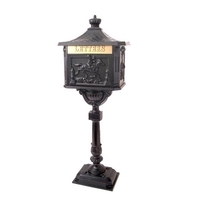 The letterbox has a highly decorative roof pattern and horse related motifs on all four sides. 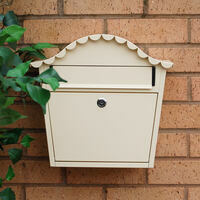 A gold effect post flap has the word letters cast onto it and is located on the front of the letter box. 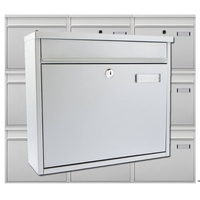 The main, side opening, lockable door is on the opposite side of the letterbox. 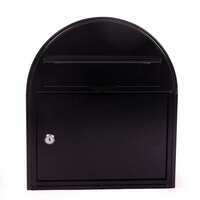 The letter box has a matt, black textured finish. Post slot size: 31 x 4cm. A4 capacity. Comes with lockable, secure door and 2 keys. Some self assembly is required and all fittings are provided. 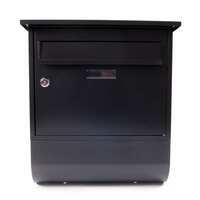 Our Newspaper Box is ideal for your newspaper deliveries. Keeping themout of the weather, safe and dry. 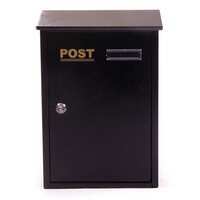 The top loading post box has a non-lockablelift up lid.Unsuitable for coastal areas, as salty air will cause tarnishing.Please notethat when fitting the lower two fixing holes, they are accessed from underneath the letterbox.- Top loading post box has a non-lockable lift up lid.- 42cm Height x 27.5cm Width x 15cm Depth.- Opening 27 x 15cm.- All Fixings included.- Black colour.- Delivered in 5-7 days. Personalised version available HERE VIDEO GUIDE Here is a video guide showing how to fit your letterbox. 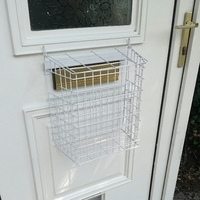 Our Belfast letterboxes with a newspaper holder are particularlyuseful for keeping your newpaper dry and away from pesky pets. 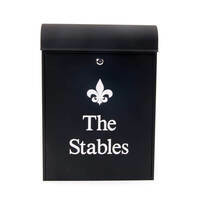 Our Belfast letterboxes with newspaper holder are made fromgalvanised steel with a black finish.They have a lockable, side opening door, come with 2 keysas well as wall fixings. 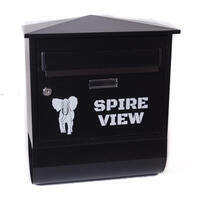 Belfast Letterbox with Newspaper holder - non personalised version Overall size: 43 x 38 x 17cm. Sturdy galvanised steel construction with black finish. Lockable, side opening door. 2 keys included and wall fixingskeys included. Post slot size 29.5 x 3cm. Personalised version available HERE VIDEO GUIDE Here is a video guide showing how to fit your letterbox. Across the UK it is now illegal to smoke in a public place. Many locations haveadopted designated smoking areas. 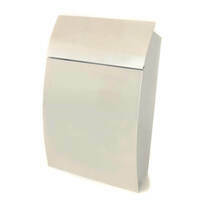 Perhaps your business has adopted thesame principalto avoid littering and to keep your property smoke free.If this is indeed the case then one of our cigarette wastebins will come invery useful for you.- Overall Size: 26 x 26 x 16cm. 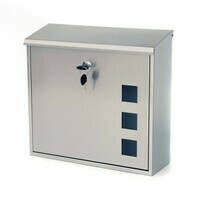 - Galvanised steel box constructionwith stainless steel front. 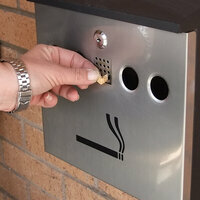 - The cigarette bin includes stubbing grid and ash container. 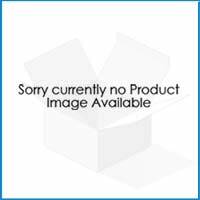 - Lockable door with 2 keys - Wall fixings provided. - Delivery 2-3 days. Why not call us to ask about adding your own company logo to this product on 01978 800 400?Delivery of personalised cigarette bins may take 5-7 days.